Brittany is split into four departments, each with its own very distinctive natural and cultural characteristics and also each with a marked individuality in the peculiarities of the property market. There is the Ille-et-Vilaine (35), home to the regional capital city of Rennes (Ille-et-Vilaine Property Guide); the Côtes d'Armor (22),with its picturesque mediaeval towns and lovely coastline (Côtes-d'Armor Property Guide); Finistère (29), land of the sea and home of many myths and legends (Finistère Property Guide); and the southernmost department, Morbihan, where the weather is said to be as sunny and warm as it is in the south of the country (Morbihan Property Guide). Which Brittany department you choose to buy property in depends on several factors. These include the type of budget available to you, the lifestyle you seek, the importance of being close to an airport or ferry port, the type of property you hope to buy, and the location within the department. For example, do you long for a house with a sea view (something Brittany has in abundance with a coastline stretching almost round three whole sides of the region) or do you dream of a traditional Breton longere… a long, low farmhouse in the countryside? The Côtes d'Armor is probably the most popular department with British property buyers... although the property market in Brittany is moving and changing all the time, so don't take it for granted that it will remain so! This part of Brittany is located in the north, and has as its capital the town of St-Brieuc (St-Brieuc Property Guide). The town is typical of the department, with its half-timbered houses oozing traditional Breton charm, and its location on this popular stretch of coast with its family friendly, safe sandy beaches and calm swimming waters appealing to many property seekers. Unsurprisingly, the British love this part of Brittany, and the price of property here bears witness to this. Many parts of the Côtes d'Armor, notably the northern coastal areas, are becoming very expensive, so if your heart is set on living in the Côtes d'Armor, and you are on a budget you may be forced to look further inland for your dream home. 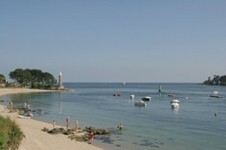 The southernmost department of Brittany, Morbihan is probably the next most expensive as people are drawn to its warm climate and lush scenery. The department is also popular with Parisians who flock to Morbihan to escape the stresses and strains of the capital at weekends and summer holidays times, so there tends to be a hike in property prices caused by an influx of Parisian second home seekers. Morbihan is renowned for its climate, which is said to be similar in hours of sunshine and summer warmth to Toulouse, which lies hundreds of miles away in the south of the country. This is due to the Gulf Stream effect, and the department also benefits from the unusual vegetation brought by this. It is not unusual to find palm trees and other exotic species of vegetation in Morbihan! In complete contrast to the Côtes d'Armor, Morbihan has its most expensive properties in the south of the department, and keeps its bargains in the north and east. The principal city of Vannes situated in the south, is highly sought after and prices can rise sharply in and near to the city (Vannes Property Guide). Full of mediaeval streets and houses, the city is a gem, and property in its most desirable areas reflects this. Anything near to Quiberon, on the peninsula, is also highly priced and sells as fast as it arrives on the market. This is a popular holiday area, and has a high concentration of tourist oriented facilities such as fabulous seafood restaurants and entertainments, all of which tend to keep prices high. Inland, however, it is a different story. Here you have the chance to find lovely rural and village properties for sale, full of Breton charm, for the sorts of prices that don't give you cold sweats. 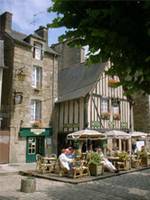 Take a drive out towards the picturesque town of Pontivy, where you will find not only a town to fall in love with, but also some of Morbihan's best property bargains (Pontivy Property Guide). Of course, if money is no object, then the south may well afford you the opportunity to find a property for sale that is really special. The coast here is delightful, with gorgeous sandy beaches and long hours of sunshine to complement it perfectly. Finistère... land of the sea, and, literally translated, "land's end". If you have ever felt the call of the sea, than Finistère is without doubt the place to put down your roots, for the department is so bound up with the sea, both historically and culturally, that it is hard to separate the two... metaphorically speaking anyway! Finistère, surrounded on all but one side by the sea, is a land of seafarers and stories, of sea shanties and possibly the best seafood in France. The simple pleasures of life are the rule here, so if it is urban sophistication you are seeking then you would be well advised to look elsewhere. This is also the place to go if you want to be truly Breton, and to escape the hordes of British ex-pats and holiday makers who do indeed seem to have taken over other parts of Brittany. Many people do indeed, however, want the old traditional properties, and there are always some interesting old properties for sale in Finistère. In general, the older buildings blend with the landscape. You will find stone longeres, often with barns and land in the inland areas, and fishermen's cottages near the sea. There are still a good number of renovation projects on the market in this department, and these usually represent very good value. As with the other departments in Brittany, the highest prices are asked for properties found close to the sea, so the big bargains tend to be found inland. Nowhere is very far from the coast anyway... the most inland towns, such as Carhaix Plouguer, which lies close to the border with Morbihan, are only about an hour's drive from the sea. The coast of Finistère is so stunning and unspoiled, however, that if you are seeking a seaside place you could do far worse than Finistère. Buying in Finistère makes sense in terms of financial investment too. This is because the department has been a little behind the others in the surge of interest from foreign, and notably, British property buyers, the prices are still a little lower, and interest in the area is increasing steadily. If all of the departments in Brittany have their own distinctive character and individuality, then the Ille-et-Vilaine is different again. This easternmost department has a feel that is not quite French, not quite Breton... perhaps it lies somewhere between the two and creates its own mini nationality! It also differs from the rest of Brittany in that it is not quite so defined by the constant presence of the sea, having only around a hundred miles of coastline. It also shares borders with two other regions, and is thus open to different regional influences on its culture. On the seaside, there is, of course, the port town of St-Malo, which makes travelling by ferry nice and easy, but also, as ever, hosts the highest prices for property (St-Malo Property Guide). The other town with expensive property is, of course, Rennes (Rennes Property Guide). The capital city of the region, and with the luxury of an airport too, property for sale in Rennes is highly sought after and always fetches good prices. Between the two, however there are plenty of bargains to be found, and lots of rural renovation properties too. If you can spot the dream home potential of a crumbling stone barn, then snap it up before someone else does, as some of the prices for this type of property are so low you won't believe your luck. Take a look at some of the towns and villages in the west of the department for the lowest prices... but be warned, this area is currently experiencing a quickening of interest so prices will rise. There are a number of factors which influence the property market in Brittany, and your search for the ideal home will be more effective if you give a little thought to these first. If budget is an issue, as it is for many, consider the departments of Finistère or Ille-et-Vilaine, and concentrate your searches inland and away from the large towns. If ease of travelling is important, look close to the airport towns of Rennes or Dinard (Dinard Property Guide), or close to the ferry ports of St-Malo and Roscoff... but be prepared to pay higher prices for property here because there will be many other people looking for property for sale with the same priorities! Departments such as Morbihan, which attract interest from wealthy Parisians looking for a second home, are usually expensive, as are any properties close to the centre of big cities such as Rennes. Generally, the most characterful towns such as Dinan are higher priced, but Brittany has so many lovely villages hidden away that it is still perfectly possible to find a picturesque setting for your new home... and on a tight budget too! Finally, although seaside and sea view properties come at a premium, nowhere in Brittany is very far away from the coast, so there is no need to give up that dream of summers on a Breton beach even if your budget dictates that your home is a little inland. Brittany, the region with four quarters which are the same... yet different... has something to offer almost everyone. It's just a matter of knowing where to look. Below you'll find links to a couple of additional articles that you may find to be of interest. These may also help you with your search for property for sale in Brittany.